The 2014 Scotiabank Toronto Waterfront Marathon took place on Sunday, October 19. A contingent of 50+ NL took part in the Half and Full marathon distance. Click here for complete results of the 2014 Scotiabank Toronto Waterfront Marathon and Half Marathon. 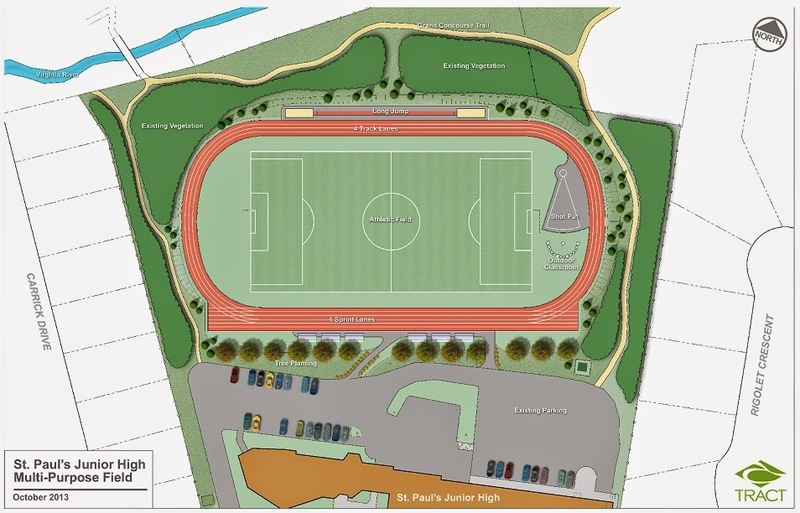 The St. Paul's Community group is continuing with their efforts to raise funds for a new Track and Field facility with 300m track behind St. Paul's School in St. John's. The group is hosting their Second Annual Oktoberfest Dinner and Auction on Saturday, October 25. Tickets are $50 and include a hot meal and drink. There will be a cash bar and auction. Tickets can be purchased from the school or by contacting Jennifer at fam.ejpike @ gmail.com or 754-0640. Trinity Western University School is in the CIS (Canadian Inter-university Sport league) and the team will be visiting our province for the 2014 CIS Cross Country Championships, Memorial University, St John's, NL, November 8. 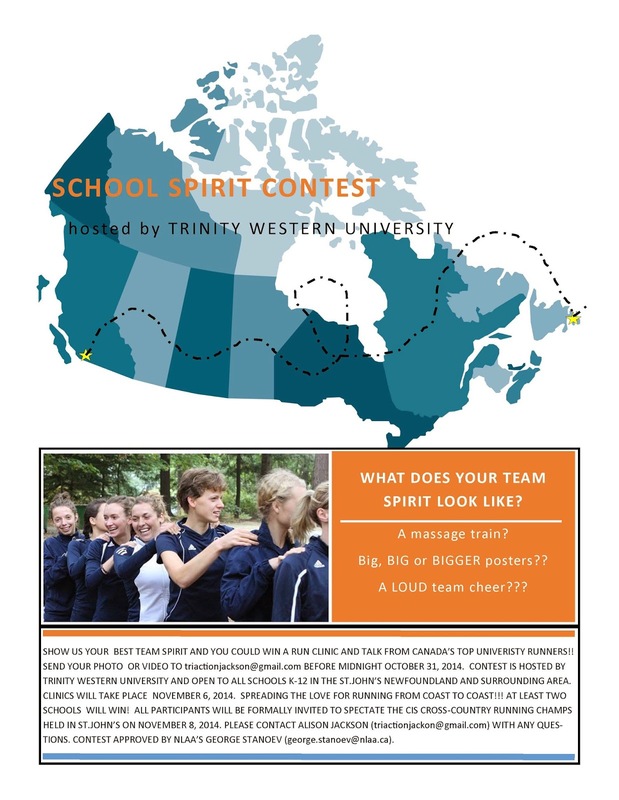 Alison Jackson, student-athlete at Trinity Western University in Langley, BC, is organizing a 'School Spirit Contest'. Alison Jackson is very excited and passionate about running and getting everyone of all ages involved. She is part of the Trinity Western University cross-country team and would like to come to St. John's and spread the love of running and the many reasons to run with kids in our community. Alison is offering a 'School Spirit Contest' program between her university and primary/secondary schools in St. John's and area. The goal is that a school or a team or a classroom show TWUSpartans their school spirit in any way they think truly represents AWESOME school spirit. The best 2 entries (minimum two) will win a run clinic and talk and more prizes from the Trinity Western University. October 31 is the deadline for all entries; clinics will run on November 6. Please click here for information on the 2014 CIS Cross Country Championships, Memorial University, St John's, NL. The Annual Cape to Cabot Speaker Series takes place October 18, 2014 from 2 – 4:30 pm in Macdonald Drive Junior High Cafeteria on Macdonald Drive (enter from Toronto Street). The talks are free. Door prize: $100 gift certificate donated by LeGros and Motti’s. You don't have to be a runner to benefit from these inspirational speakers. Here's the lineup. 2:00 pm: Art Meaney: This former Tely 10 champion will speak on proper running form and running while aging. 2:30 pm: Nancy Winchester, who has run 42 marathons will give a talk entitled: How far was that marathon? Stories of training, motivation, and managing nerves and non-running friends over 1100.4 miles in convenient 26.2 mile increments. 3:00 pm: Derrick Roul, who was diagnosed with leukemia in 2012, will speak on the importance of family, friends and running buddies in his fight to be cancer free and get back on his running feet. 3:30 pm: Keith Butler and John Grant make a formidable racing team with Keith pushing John in a custom-made racing chair. Their talk will focus on the 2014 Boston marathon, the logistics of getting to the start line, the challenge of pushing a 200-plus-pound chair with virtually no training and the thrill of running alongside Team Hoyt in their final Boston Marathon. 4:00 pm: Panel with Caroline McIlroy, ultra-marathoner who recently ran 190 km of the East Coast Trail in 30 hours; Patrick Dalton has transformed himself from an overweight smoker into a lean mean Iron Man who competes nationally against world-class triathletes; and Florence Barron, 76-year-old two-time Tely 10 record holder.